Dubarry&apos;s Pacific X LT two-eye tie men&apos;s deck shoe, is a hand sewn men&apos;s moccasin on an ExtraLight sole unit. 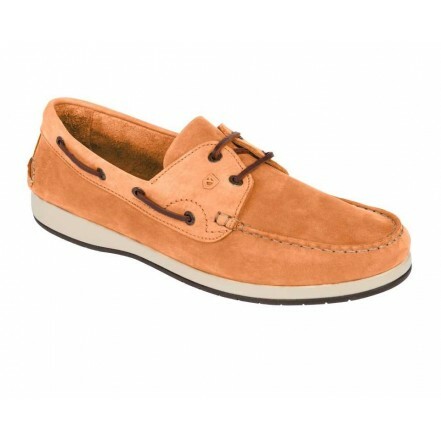 This soft Nubuck leather deck shoe features a DryFast water resistant finish. A high performance men&apos;s leather boat shoe, Pacific X LT delivers improved shock absorption and superior grip with its rubber NonSlip-NonMarking outsole. Ideal for on and offshore, this flexible leather deck shoe works perfectly with shorts or trousers and polo shirts or shirts under a men&apos;s waterproof jacket or men&apos;s casual jacket. High performance, two-eye tie hand sewn men&apos;s moccasin on an ExtraLight® sole unit. • Water resistant and breathable DryFast-DrySoftÃ soft Drummed Nubuck leather upper. • Super extra-lightweight midsole combined with flexible, lightweight upper construction.